(Nanowerk News) NASA scientists used software from Siemens to help create the new Mars rover Curiosity, which is currently on its way to Mars. The 900-kilogram rover is the largest Mars vehicle to date. It will reach the red planet on August 6, 2012, and begin to conduct various experiments to obtain new information, which it will transmit back to earth. Development software from Siemens helped to ensure that all of the components fit together, work properly, and withstand the mission's harsh conditions. Scientists at NASA's Jet Propulsion Laboratory used Siemens PLM (product lifecycle management) software during the vehicle's entire development process in order to digitally design and simulate the rover and virtually assemble it without having to build a prototype. PLM software technology from Siemens is used to produce and manage product data throughout the entire lifespan of a product: from the first ideas and designs, through the entire production process, and even up to retirement and recycling. Over 7,000 Siemens employees serve more than 70,000 customers using 7 million licensed seats of software. Mars rovers have to fulfill particularly tough requirements during launch, while traveling through space, when entering Mars' atmosphere, and while landing on the planet's surface. As a result, Curiosity has to be able to withstand extreme differences in temperature, high acceleration rates, and intense vibrations and radiation. 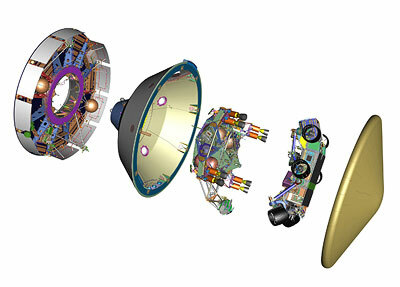 Thus, the design and production of such rovers is an extremely complex task. Moreover, there's no second chance during a space mission, as nothing can be corrected or repaired after the launch. To develop the vehicle, the NASA scientists therefore used Siemens' PLM software with the construction software NX and Teamcenter for data management. Teamcenter enhances the cooperation between different design teams by always providing them with the latest data. The NX software consists of CAD, CAE, and CAM applications for computer-aided design, development, and production. Among other things, NX was used to create a temperature model of the rover. To do this, the researchers used hundreds of temperature sensors to test the rover in a special chamber in which a carbon dioxide atmosphere, a super-cold floor, and a sun-like radiation source imitated the conditions on the Mars surface. NX used the collected data and results to calculate a temperature model that can virtually simulate conditions that cannot be duplicated on earth. In addition to helping the researchers design and test the system, the 3D model is currently being used during the flight. Siemens' PLM software is widely used in the aerospace and car industry. In combination with Siemens' automation technology, the software reduces the time to market by up to 50 percent and helps save resources and energy.